The CCFC Winter Quads were the scene of fierce competition as no one scored a perfect 3.0 and a higher rating was no guarantee of victory! In the first round, Ian Harris beat David Childs, Daniel Lowinger won against Noah Arthurs, and Kapil Chandran defeated Maurice Rosado. That set up the second round showdown between Harris and Lowinger, and Harris emerged victorious. Arthurs managed a draw against the higher rated Chandran and David Childs pulled out a victory against Rosado. 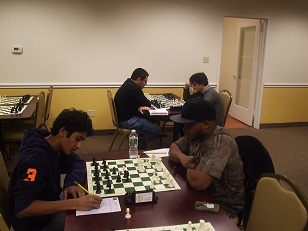 In the final round Harris’ winning streak was ended as he drew against Chandran. Lowinger managed defeat Childs and Arthurs defeated Rosado. Stay tuned for results from the next Thursday Winter Quads.